I love architecture, in no small part because I practically grew up on numerous large, commercial building sites where my dad was the supervising architectual engineer. However, successful photography of buildings involves much more than simply a love of the building industry. Turning this professional grade out-of-the-camera image into a commercial-grade final product requires a lot of expertise in postprocessing. That's what I do, and I do it well. In fact I've been doing it since 1995. After correcting color, contrast, gamma, and perspective, I was still left with a somewhat ugly photograph. The next step was to create and blend layers to even out the brightness of the sky with the darkness of the house. Even then the photo needed improvement. The lawn was torn up by all the heavy machinery during the project, and the homeowner, an avid gardener, had not yet gotten his landscaping back together. Therefore I patched grass into the bare spots. This was certainly not a misrepresentation of the builder's work. The builder was not in the landscaping business, after all. The final product allowed the builder to represent his work in a flattering and commercially appealing way to prospective clients. As tricky as exterior photography can be, interior photography is doubly tricky. 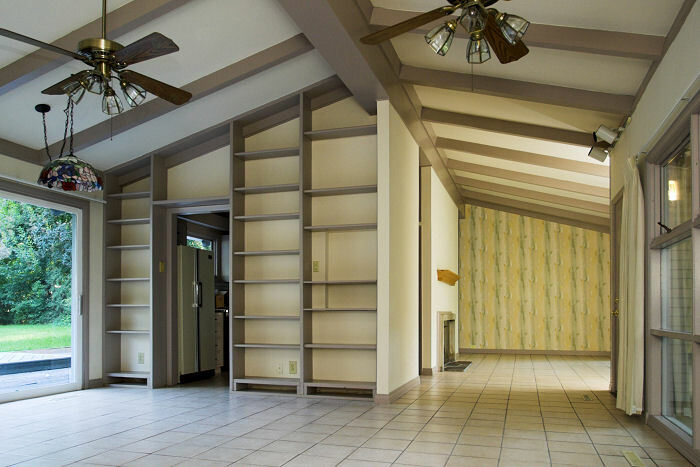 Consider this very light and bright Usonian residence, featuring large windows covering approx. 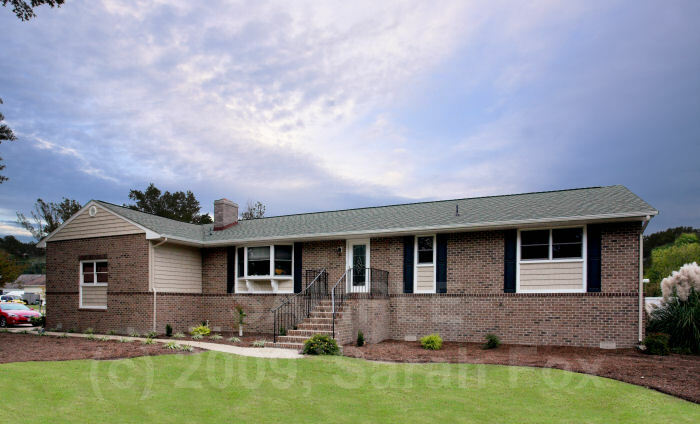 75% of the living room and den wall areas, overlooking expansive patios and wooded views. This is about as optimal a shooting environment as one could hope for in any residence. However, even with all of the light that flooded into the home, the living room and den look rather dark, compared to the exterior. This picture is taken with no flash. The look is natural and mildly flattering, but it is still somewhat lifeless. Most beginning photographers would not photograph the room without flash. Instead, they would rely on the program mode on their camera, which would automatically pop up the built in flash to attempt to fill in the dark areas. This photograph is typical of this sort of result, although it is actually photographed with a professional 550EX shoe-mount flash. Note the ugly shadows, glaring reflections off of the ceiling fans, woodwork, draperies, and trim work, black-out zones, and generally poor depth or character. Very few photographers have more than a single flash, even it if is a good one like my 550EX, and they cannot easily extend beyond these sorts of results. In my opinion, if a photographer is smart and has only one flash, he or she will generally not use it and will seek postprocessing solutions to uneven lighting situations. However, very few photographers are familiar with postprocessing techniques beyond the most basic brightness and contrast manipulations. The most sophisticated photographers know how to use multiple light sources to achieve flattering results, lending warmth to an otherwise dull scene. In this scene, I used four flashes. The triggering flash was a tiny infrared strobe that mounts to my hotshoe. The sole purpose was to trigger the other three flashes via infrared slaves. Two of the remote flashes were located behind the camera, set to low power levels, and bounced off of the wall behind me, to create a soft fill light for the living room. The final flash was set to a much higher power and was located outside the den's large window. 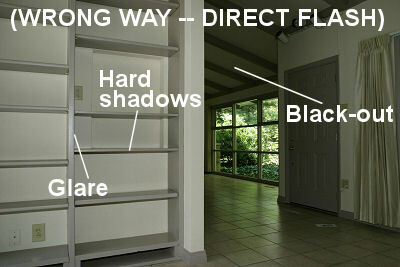 That flash was used to simulate a flood of warm sunlight into the house. The added illumination in the interior balances out the lighting between the interior and exterior, so that detail may be seen throughout the image. This was of key importance to the Usonian emphasis of this period home, based on Frank Lloyd Wright's vision: " I began to see a building primarily not as a cave but as a broad shelter in the open, related to vista, vista without, and vista within." Failure to achieve a proper visual harmony between exterior and interior would have failed to convey the design philosophy and appeal of this modest but serene home. As with the living room photograph, I took this photograph with two off-shoe flashes, triggered via an infrared flash. 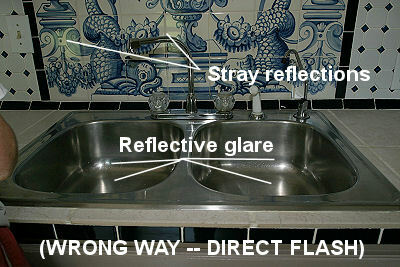 The reflection of one of the flashes is just visible in the knob on the left cabinet door. 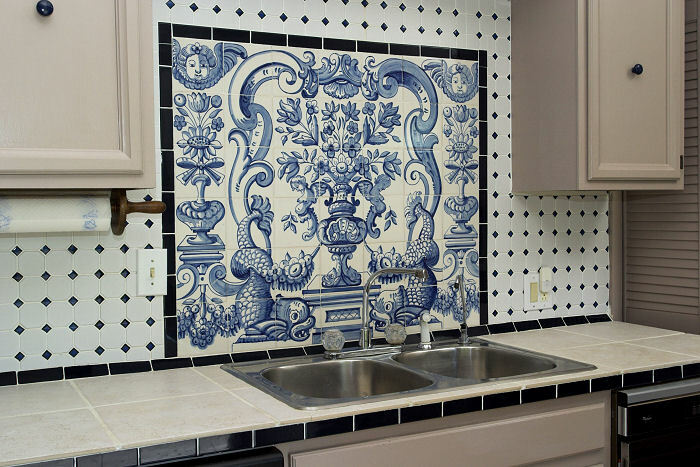 This lighting setup gave the sink a soft sheen and put the beautiful tilework in a much more flattering light, emphasizing it greatly over the mundane stainless steel sink. Not all lighting scenarios are this easy. 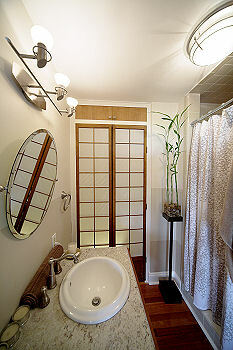 For instance, a bathroom may be covered with mirrors, shower glass, glossy tile, and bright chrome fixtures. That is a lighting problem that can baffle even the pros, especially when trying to cram lighting equipment into a tiny space where it will be seen in mirror reflections. I am proud to offer a technique of which only rare pro photographers are aware, and which even fewer know how to use. I call it BlackART (for "Blackout Anti-Reflective Technology"). With BlackART, I can literally put a flash on my camera, point it directly at a mirror, and take a picture of myself with little or no return glare, as seen here. These images were shot in the mirror of a darkened bathroom, with BlackART disabled (above left) and enabled (above right). The image on the above right is essentially "the impossible shot," in which the full output from my powerful 550EX flash appear as barely a highlight, and all reflections are gone. There are no reflections off of my teeth, eyes, camera, lens, or even my skin (which makes it look a bit strange). I can enable or disable BlackART in degrees, so as to blend some reflection if desired. By the way, please do not ask me to explain the mysteries of BlackART, as I protect the technology as a trade secret. In addition to lighting wizardry, I also boast of the widest angle optics available on any camera, which is of considerable help when photographing small spaces such as bathrooms. With my widest rectilinear (i.e. not fisheye) lens, I can stand in the corner of a room and photograph all four walls, with a maximum angle of 122 degrees diagonally, 90 degrees vertically, and 113 degrees horizontally. This very extreme lens allowed me to capture a very complete image of this bathroom (see above) of approx. 5 ft x 5 ft. Bathrooms this small are rarely photographed, owing to their size. Finally, all the wizardry in the world cannot compensate for an inadequate photographic sense. One must not only master all the tools and technologies at hand, but also have a sense for what to photograph. 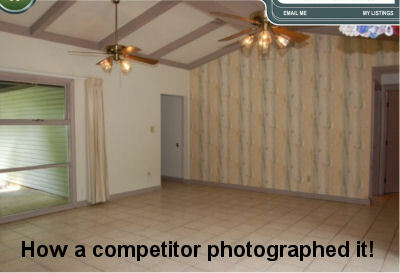 The photo shown here is not mine, Rather, it is the product of a competitor who the realtor hired before me. 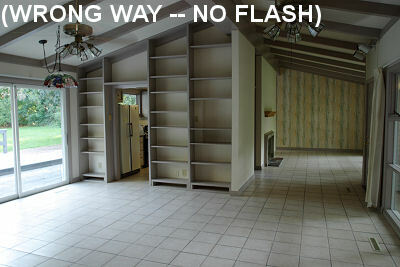 This was the professional photographer's vision of how to photograph the living room. Her views aren't as expansive, owing to an inadequately wide lens, her image is fuzzy (much fuzzier in full size), the lighting is dull, the colors are wrong, and the direct flash casts shadows from the ceiling fans onto the far wall. But most of all, she missed the entire point, photographing the entrance from the garage, rather than the grand view (the most important view) through the house and extending to the outside. Her other shots were similarly uninspiring. One could argue that too wide a lens or too much license in lighting tricks can misrepresent a home; however, I contend that a "straight-up" photograph hardly ever represents what a person sees with any accuracy. This photographer's "straight-up" images, while technically accurate, did not convey the feeling of space and light one experienced in this home. My own photos conveyed a representation of the property with more perceptual accuracy. Achievement of perceptual accuracy is as much an art as a science, and it is usually my ultimate goal. 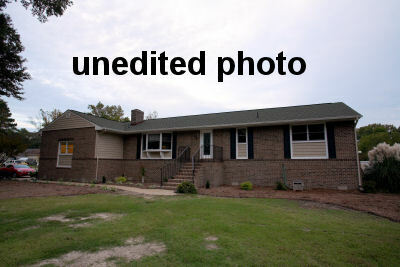 I feel I can reliably and consistently generate results that are far superior to those of the vast herd of real estate photographers who have recently purchased digital cameras and offer themselves up as professionals. Naturally my services are more expensive than theirs, but I do believe you get what you pay for, particularly in photography. I could also take their sorts of pictures the way they do it and charge what they do, but that is not something I am interested in doing. My services are best applied towards high-end marketing of real estate, hotels, time shares, and corporate environments. I feel that my services provide a good value that will draw prospective buyers and customers by representing properties in their very best light. Let me bring my experience in photography and my excitement for architecture to your project. Please contact me to set up an appointment to discuss your architectural photography needs.